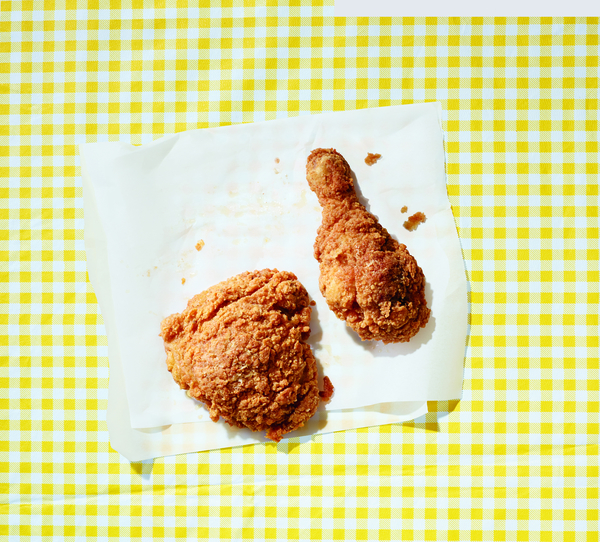 When was the last time you had gluten free fried chicken? It had been an eternity for us when we heard that San Francisco restaurant, Firefly, was clandestinely making and selling GF fried chicken nightly to diners who had no idea it was gluten-free, but loved it just the same. Of course we bee-lined to the restaurant, only to discover that they are making the best GF classic fried chicken we’ve ever had. It seems the owner/chef, Brad Levy, who was famous for his fried chicken, changed up the recipe when he learned his daughters had celiac disease. Brad kindly shared the recipe with us, and now we get to share it with you. Bonus: it’s panfried, so you can skip the deep fryer! In a small bowl, combine the paprika, granulated garlic, onion powder, ancho chile powder, and cayenne. Set the spice mix aside. Line a baking sheet with parchment paper. Place the chicken pieces in a single layer on the prepared pan. Sprinkle the pieces evenly with 11⁄2 teaspoons of the salt and 3⁄4 teaspoon of the pepper followed by half of the reserved spice mix. Turn the pieces over and repeat with the remaining 1 1⁄2 teaspoons salt, 3⁄4 teaspoon pepper, and spice mix. Cover the chicken loosely with a piece of parchment paper and refrigerate for 30 minutes. Combine the milk and buttermilk in a small bowl. Make the crust mix: Combine the flour, baking powder, salt, pepper, granulated garlic, and onion powder in a large bowl. Line another baking sheet with parchment paper. With one wet hand and one dry hand, submerge each chicken piece in the milk mixture, then into the flour mixture, coating well. Gently shake off most of the flour and place each chicken piece on the clean prepared pan. Cover the pieces with parchment and refrigerate for at least 30 minutes. Gently lay each piece of chicken in the skillet with enough space to easily turn the pieces. Cook without moving the pieces to allow a crust to form, 2 to 3 minutes. Lower the flame to medium-low and cook until the crust is medium brown, 6 to 7 minutes. Turn the chicken and brown the other side, about 7 minutes. Transfer to a sheet pan with a rack to allow any grease to drip off. Check the chicken for doneness: When you insert a skewer into the thickest part of the thigh and the juices run clear, it is done. If the chicken is not cooked through after the desired crust color is reached, place the chicken on a rack in a 350°F oven, skin side up, and bake for 5 to 10 minutes more. Let the chicken stand for 5 to 10 minutes before serving.